Having vowed to purge paperwork, boxes of photos, albums, to scan or die, to go paperless, yea, to have an empty closet where all this stuff is stored…I have gotten into the task. And in one of those boxes I still have the page I tore from the Hidden Trails riding vacation catalog twenty years ago, next month (August 2018). The trip I really wanted to take from the same catalog was to ride a week from château to château in the Loire Valley in France, dining and drinking with the fabulously wealthy aristocrats who owned them…or, if not aristocrats, at least, the fabulously wealthy. But this Ireland trip was unique and most importantly, only 25% of the cost of my dream ride. 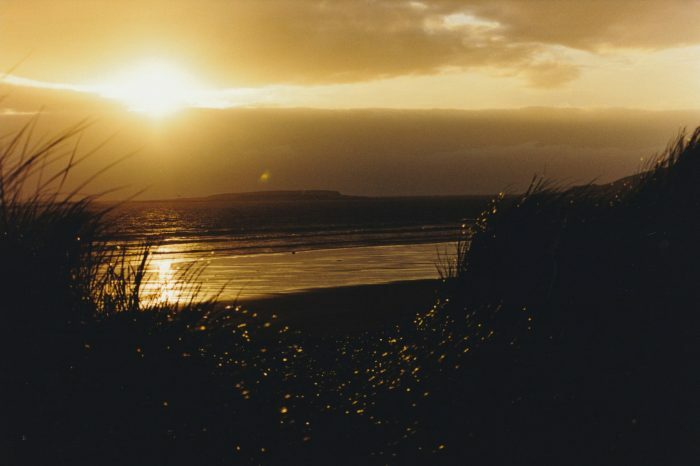 In County Sligo, Ireland, August is considered the fairest month, the warmest temperatures, and a lesser chance of rain, I was told. As you begin my story, note that in no photograph you will ever see me in shirt sleeves. 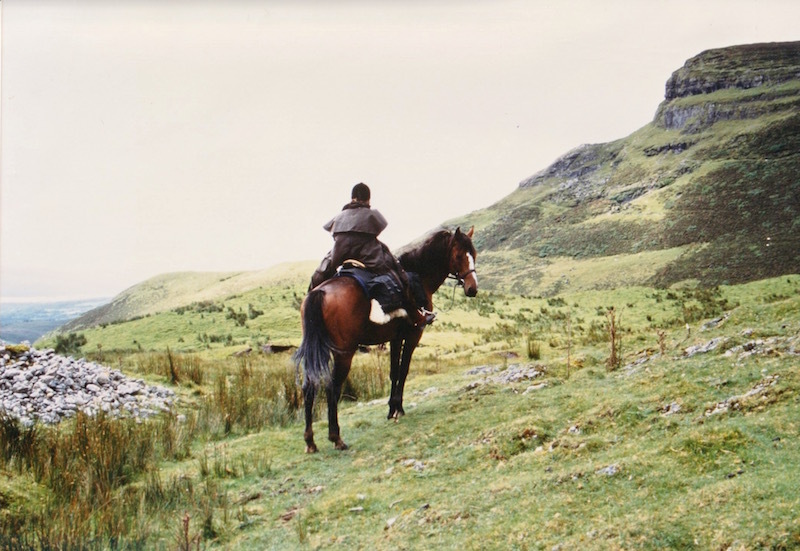 Under my flannel-lined oiled drover’s coat (which served admirably–and daily–as my rain slicker) is a fleece-lined heavy coat, and under that coat is a very heavy, genuine wool Irish fisherman’s sweater, and under that is a sweatshirt, and under that is a long-sleeved T-shirt. Just saying. From Los Angeles International Airport I had a non-stop 10-hour flight to Dublin, from which I took a commuter flight to Sligo. Even though the train travel across the entire country is only 3 hours, I wanted to save time inbound and my plan was to ride the train back to explore Dublin for a few days at the end of my trip. (Didn’t happen that way.) My taxi delivered me to the lovely Riverside Hotel in Sligo Town. It was late morning but I checked in early and because of the sleepless flight and jet-lag, fell fast asleep until dusk. 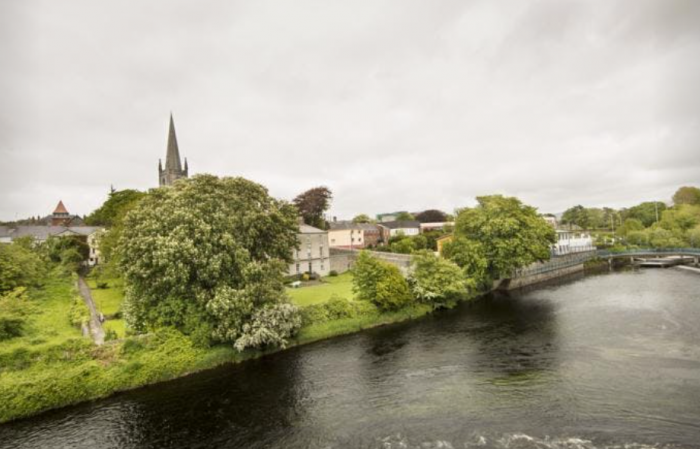 The Riverside Hotel is exactly that, right beside the Garavogue River. It’s the big building in the center of the picture, a classy and substantial place. See that mountain in the far background, that almost looks part of the clouds? 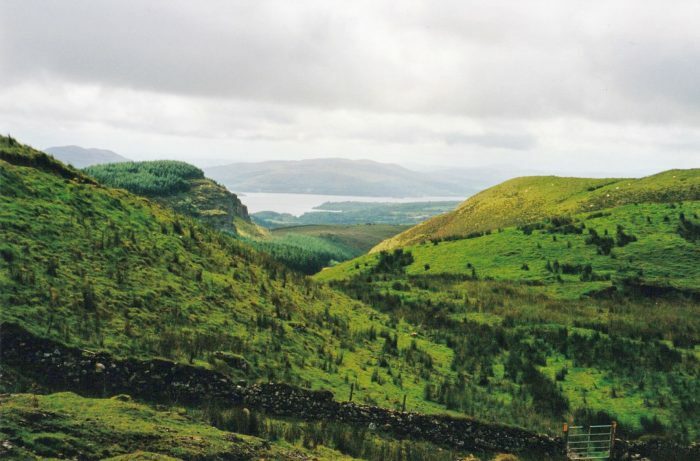 That is your first look at the Ben Bulben Mountain immortalized by William Butler Yeats, who spent part of his childhood in Sligo and always considered it to be at the heart of his inspiration. The Beaches, Dunes and Trails ride would be taking us 120 miles, riding around this mountain. And from my river view room I saw my first swans (not shown here). It was grey and drizzling, so I donned, not for the first time, my raincoat and luckily took my umbrella, which I needed as it turns out, and walked out along the river to admire all the green, green, green and swan-watch. Not too many locals were out in the rain, but those who were out for a stroll passed by with a friendly greeting and a smile. Eventually I huddled in a doorway to read my city map and strolled through the streets to the oldest pub in Sligo, Thomas Connolly, established in 1861. I was intrigued by the idea of such an old place being in daily use all that time. I walked through the front door, past the bar, all the seating and the private booths that were partly enclosed, to the back of the bar and then turned around and walked right back out the front door. The few men sitting at the bar watched my speedy exit in a puzzlement, but the place was full of tobacco smoke and I couldn’t stay another minute, let alone sit down to have a drink. This would be a constant theme in my two weeks in Ireland. 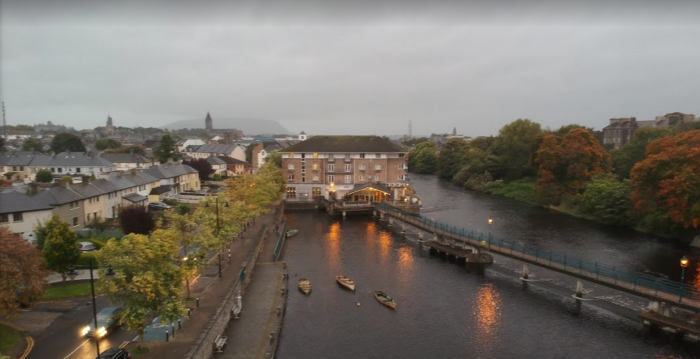 I found a cute bistro to have a light dinner, and made my way back to the Riverside Hotel, where I went to the somehow smokeless bar to have the most delicious Irish whiskey of my life for dessert. 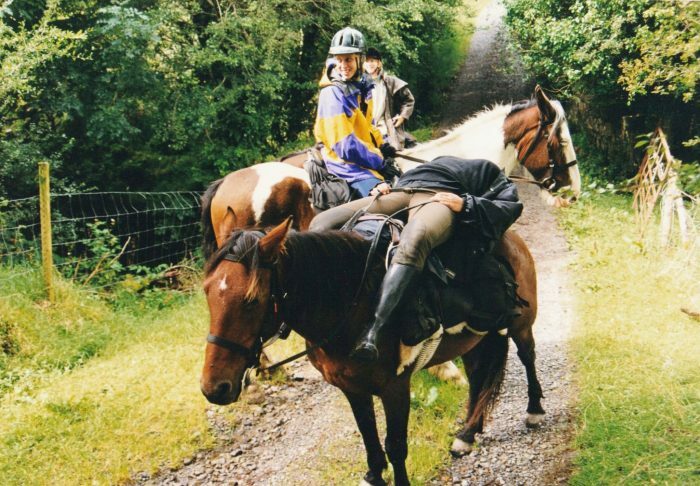 I felt like a million dollars the next morning, after a great night’s sleep and a big Irish breakfast, but when my taxi dropped me at Horse Holiday Farm in the early afternoon, I had a feeling of misgiving. It was a large commercial establishment with big groups of riders coming and going on all types of horses imaginable. I checked in at the office and was given a set of saddle bags (which contained a brush and hoofpick for my future equine partner), a big colorful map which contained a couple of mysterious notes such as “Be careful of land,” a tidal chart, and a list of overnight stops. I had indicated that I wanted to do this trip on my own but after looking at the map, was more than a little relieved when I was assigned to a group of four other people. Two of them were a newly married couple who were clearly not happy at being instructed to be part of a group, and a mother and daughter from Germany, who had been on this trip a couple years before and boy, did they come in handy as they recognized some of the scenery and prevented us a couple of times, but not all the times, from getting lost or going in the wrong direction. On the information intake form, when asked what kind of horse I would prefer to ride, I had simply asked for a horse that was light to ride. Imagine my dismay when the groom led up my assigned mount, a gawky, lumbering 17 1/2 hand Irish sport horse, gaunt and clearly tuned out. 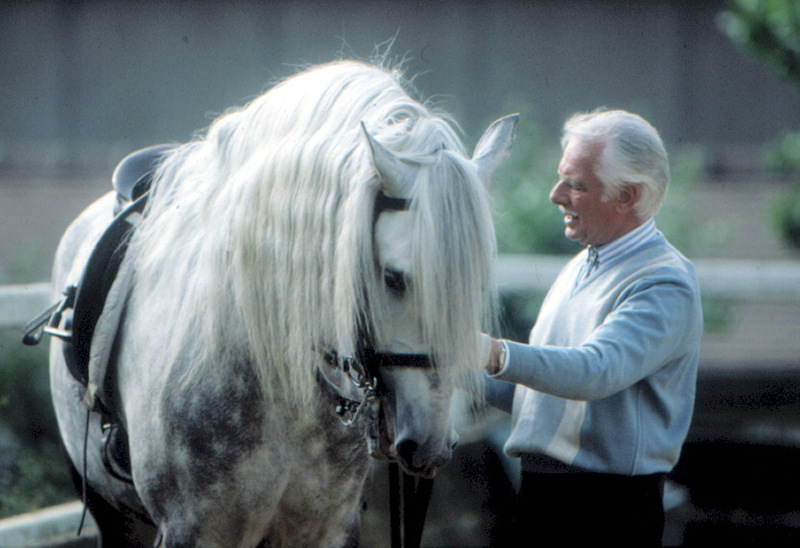 He was so tall that at 5’3″, I couldn’t get my foot in the stirrup to mount. 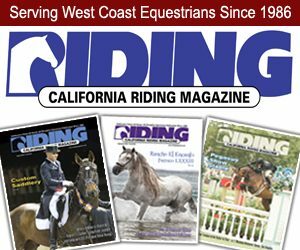 As I wondered how I could manage riding cross country for 120 miles on a horse I could not even mount, the groom prodded the horse over to a mounting block and suddenly I found myself sitting on a house, thinking that this must be a joke and now they will bring out my “real” horse. This was a trial ride for our group, led by two grooms, one a cute boy with curly black hair, pink cheeks and bright blue eyes which were more or less riveted on the other groom, a pretty German girl who looked much like Kate Winslet, who told me she was working at Horse Holiday Farm for the summer. We rode out on farm roads and in between fields and passed another group who had clearly already been to the pub to which we were headed. Riding this horse was like riding an elephant and I was not enjoying anything about it. He basically ignored all my aids and just followed the other horses. I was going to have a talk with the grooms. The interior of ODonnell’s is a rich golden yellow, giving the feeling of warmth and cheer. Girl groom held all the horses while boy groom inhaled a pint and a half of Guinness and two grilled cheese sandwiches before hustling out to change the watch so girl groom could come in for her refreshments. 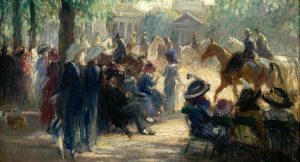 I could surmise that the grooms ate and drank on the house if they brought in the groups of riders who paid. I noticed how truly hungry the boy was and the girl confided they worked very hard and were supposed to get board as part of their pay at HHF, but that ended up being leftovers from the riders’ meals who might eat at the facility. And many nights they just ate cereal for dinner. When I could get up and stand, the pain in my hip started and of course since I had hit the ground so hard, I expected to feel some kind of consequence. So somehow we got me back on the elephant and the boy promised to get me another horse for the ride that started tomorrow. 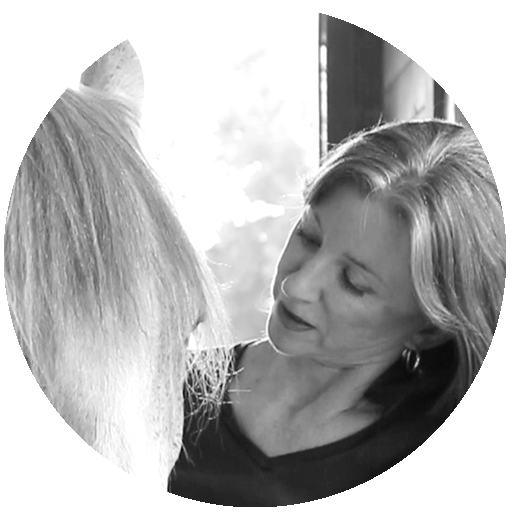 It was a few kilometers back to the farm and with every lurching step of my mount the twingeing in my hip was getting worse. I started to get worried it might be something serious. Back at the farm I needed considerable help getting off the horse and the barn manager came to see what happened. The boy groom informed the manager that I had fallen and since I didn’t want him to get fired, I didn’t contradict him. The two groups staying at the farm overnight before their rides started the next day, mine and one other, were having dinner at the farm house, and in the other group two of the riders were two doctors from Sweden. They were friends back home, attractive and friendly, and after dinner they did a cursory examination. Of course they told me to not go on the ride and go to a doctor the next day. They were going to a pub down the street before bed and invited me along. The bar was so thick with smoke I sat outside on the curb and one of the girls brought me a glass of wine, and came out to say hi a time or two. Once we returned to the farm, one of them told me that she feared something was really wrong and I really did need to see a doctor. However, she opened up her black bag and gave me 7 pain pills, one for each night of the trip. “At least, if you are going to do this, you will be able to sleep,” she commented darkly. The next morning the other group, which was going in another direction, rode off and the doctors waved goodbye, looking at me doubtfully. The barn manager assigned me another horse, a smaller bay Thoroughbred-type gelding by the name of Parole. Parole had two barely healed saddle sores and I voiced my concern to the manager about how these would hold up under riding. The standard saddle pad at this facility was an entire, unclipped sheepskin used pelt down on the horse’s back and a trekking saddle cinched on top of that. “Oh he’ll be grand, Parole here is fresh off two weeks vacation so he’ll be ready to go.” Hmm, we’ll see. Since we were not riding far for the first day, after lunch we saddled up and off we rode, maps in hand. 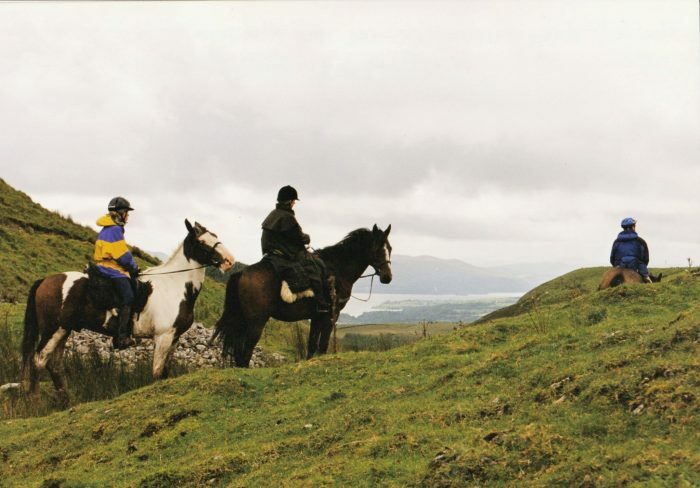 The Wild Atlantic Way refers to the coastal region of the west coast of Ireland and it spans six regions. 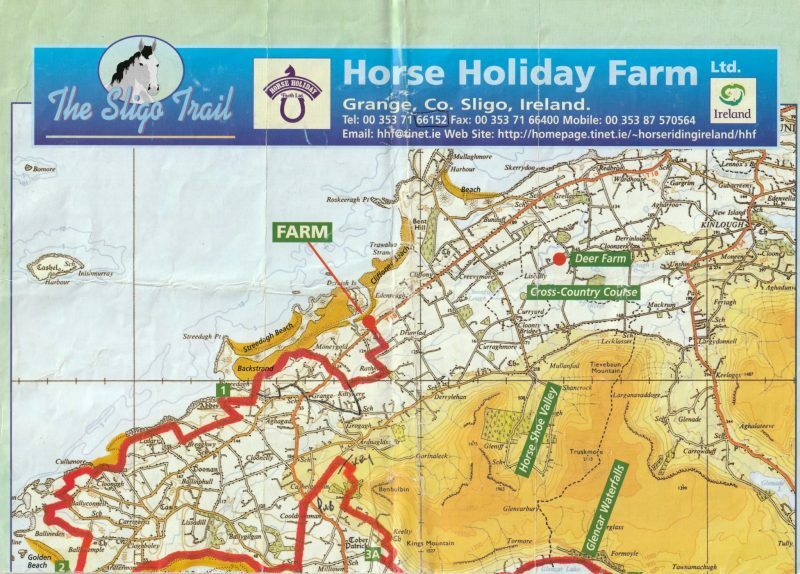 Because we were basically riding in a circle in County Sligo, our taste of the Wild Atlantic Way was shortened a bit. Here we are at the start of our 120 miles. Parole, the horse that could not stand still for even a moment, as we found. And what is that in the background? 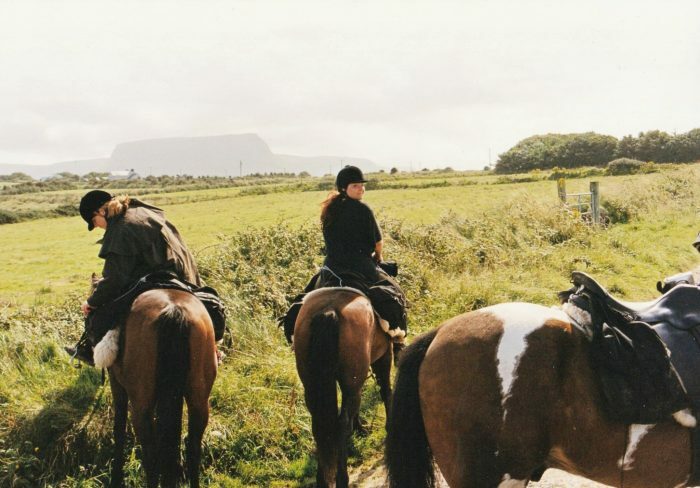 Why it is Ben Bulben at the beginning of the ride. Yours truly on the left, fidgeting to pull that darned sheepskin forward to stay in place, which it never did. The young lady in the middle is the daughter of the German mother-daughter pair, whose names I unfortunately cannot remember. 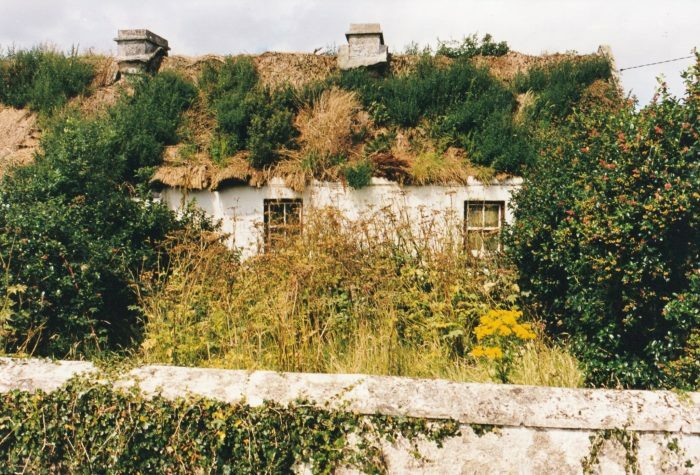 In Ireland, you can’t turn your back for a minute or Nature will take over. 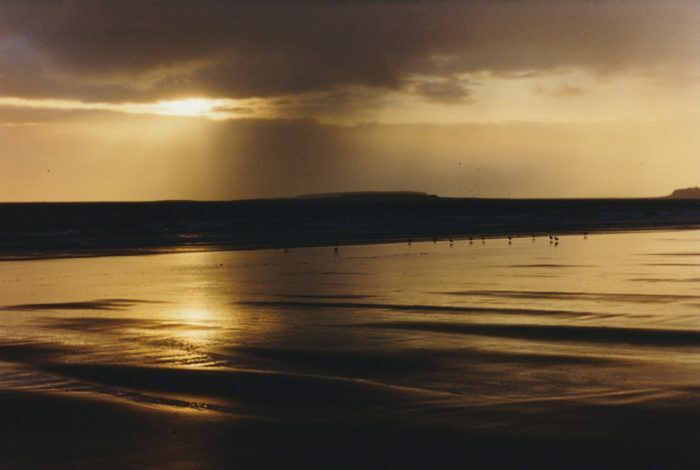 From the farm we rode down to Streedagh Beach, a long stretch of sandy beach that was the final resting place for many of the up to 1800 sailors who perished when three ships from the Spanish Armada were wrecked in 1588 while trying to shelter from Atlantic storms. The rest of the group took off in a mad gallop which was out of the question for me, and the best Parole could give me was a ferocious jig from being rather forcibly held back. 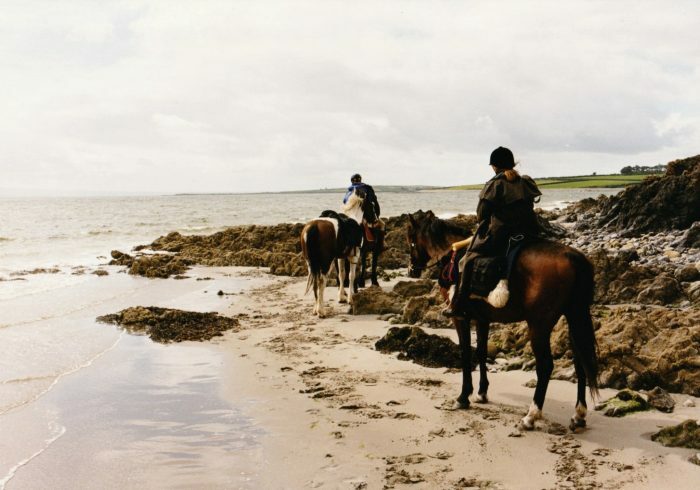 It was extremely painful in the end and I considered with irony how my much dreamed of gallop on the beach in Ireland was turning out. I could also tell that the rest of the riders were concerned that I was going to hold them up, which I could understand. I was really questioning if I could do this after all, and decided to just keep going as long as I could. The brush smelled wonderful and showed off with all kinds of yellow flowers. So, not for the last time we missed the tide and had a rough scramble over some rocks to get back to the land to retrace our steps. 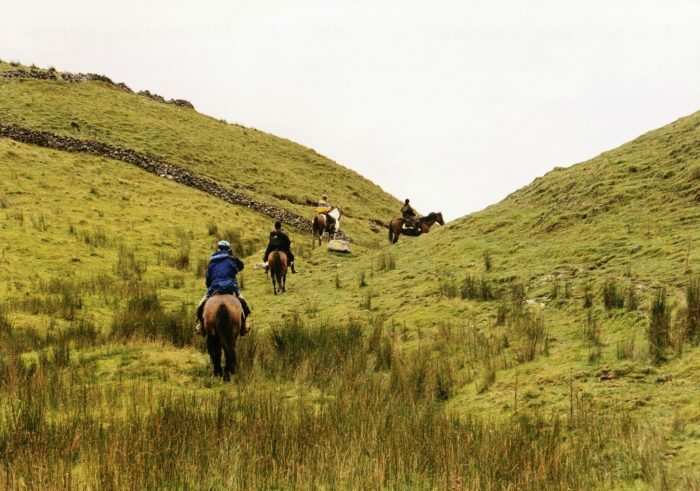 One of the riders walked over the rocks and found the best path for our horses to go. No horses were hurt in the process. After retracing, we pulled into the guest house fairly early and it was just barely adequate. Sparse furnishings and a sparse dinner and a sparse breakfast the next morning. 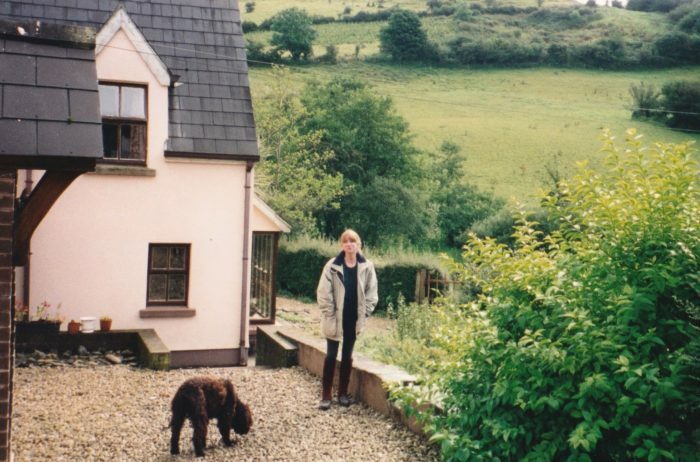 The daughter of the house was very charming, with honey blonde hair and a sparkling smile, and went with me on my short evening walk, passing the time of day in talk, skillfully as the Irish all do. She was the best part of it. Right next to the pain pill I finally awarded myself at bedtime. 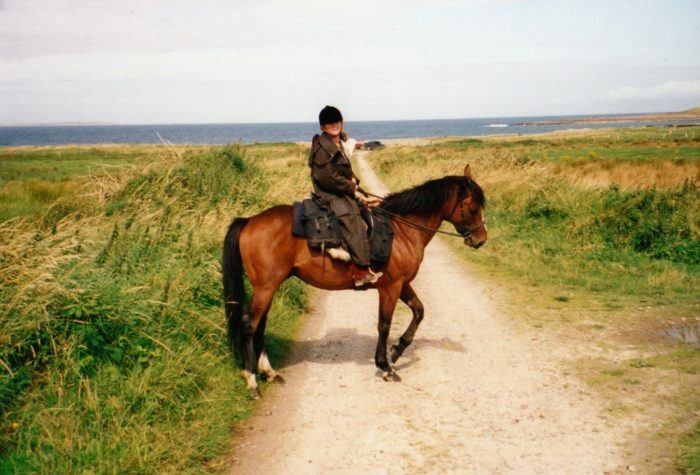 The next morning we rode along the coast to Yellow Strand for another gallop that poor Parole did not get to enjoy (and I did not enjoy his jigging by any means), then across some boglands before reaching a village where we got lost for the first time. Note, I say the first time. 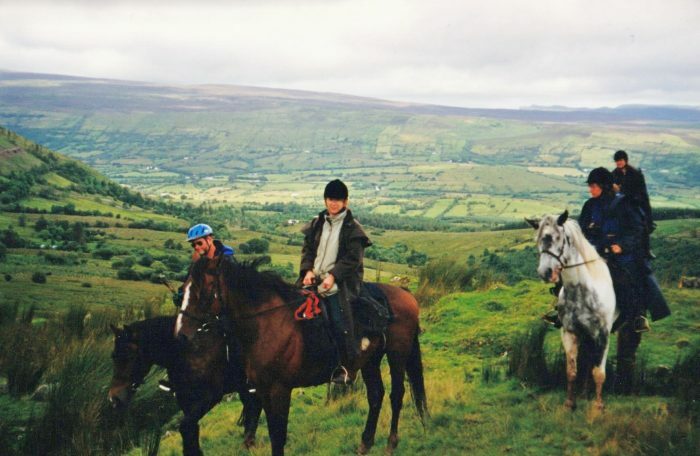 There were two routes in Sligo for riding vacations. One route was called the “white” route, and the other route, ours, was called the “yellow” route. To aid in making the correct turns since the streets were not usually marked, white arrows were painted and yellow arrows were painted. When the paint is not refreshed often enough, we found, the yellow arrows were so faded as to look white. Add to this the horse manure which when run over and flattened by cars, and faded by the sun, looked identical to the dirty white arrows and the faded yellow arrows. This afternoon we went in circles for a while before accidentally finding our way out of the arrow maze, though the high point was going into a grocery to ask directions and buying two tiny bottles of Glen Ellen California chardonnay for pain killer and a packet of cookies. After passing Raughly, a small pretty peninsula on Ardtermon Strand, we arrived at our delightful guest house, “Seaview Farmhouse”, run by Colm & Mary Herity, who are still running it today. In addition to the meticulously clean farmhouse they ran a small farm and the horses were happily munching in their pasture across from the house in short order. I was not so happy because Parole’s saddle sores had been rubbed as I knew would happen. I called the farm and they brought a therapeutic pad with cut outs for the now bleeding areas. I asked for another horse so Parole could be rested until his back was completely healed before being ridden again, but they said it wasn’t possible, he had to work and earn his keep. I was not pleased with that answer. But the property was surrounded on three sides by the ocean and the view was spectacular anywhere you looked. What were we given for dinner? Fried fish, potatoes and peas. 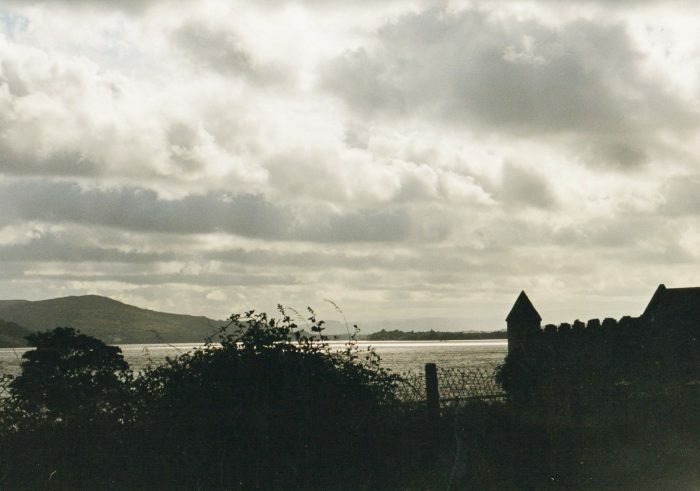 It was raining and frosty-breath cold in the morning, this being August, the best weather in County Sligo. 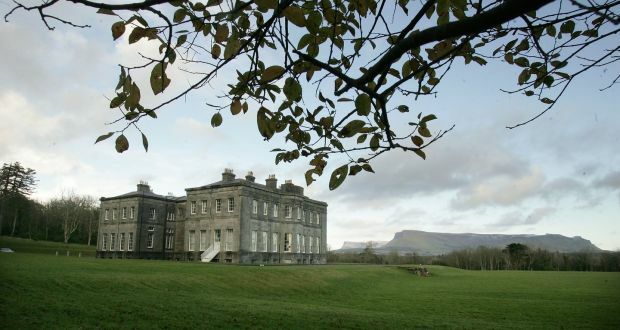 I did see Lissadell House on a subsequent trip to Ireland, you will be glad to know. The riders didn’t stop either, they wanted to keep going and get out of the rain, as I recall. 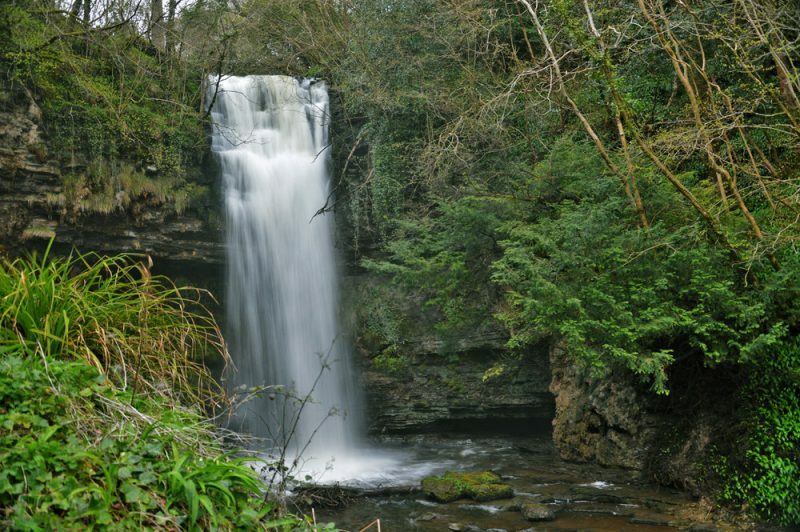 And there is Glencar Waterfall…we could see it in the distance from the road when the farm brought Parole and me to the night’s guest house. 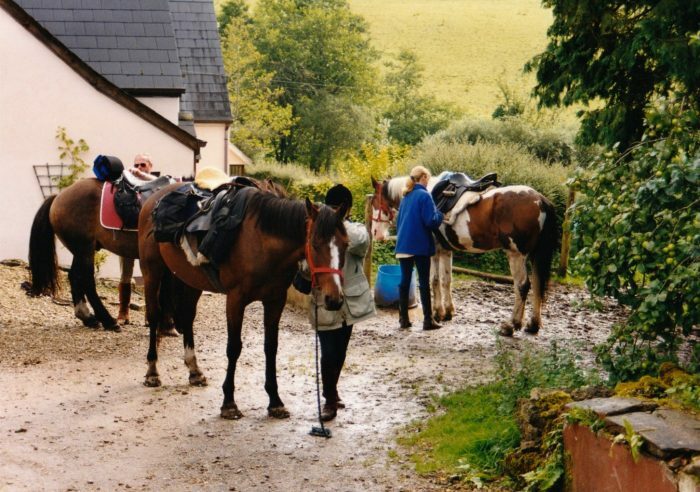 The lovely hosts in Glencar were the owners of a big farm and the horses had great pasture. I had just gotten Parole settled and limped back to the house when the other riders came in, dragging their wet tail feathers. And continuing the pattern of not having any lunch because there was no place to get any except buying a snack at a village grocery, they were starving and happy to eat what we were given…fried fish, potatoes and peas. Good morning! It takes me about 1/2 hour to mount Parole but we eventually take off in the rain. Some times it rains and sometimes it doesn’t. We are required to wear riding helmets on the ride and rain is going down the back of ones neck and soaking one’s clothing etc. 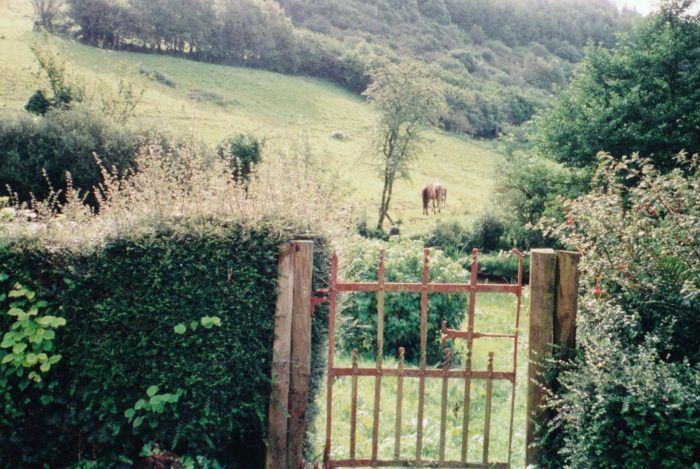 From Milltown we have been following the country lanes and riding through the forest towards the Mountain of Hangman’s Hill. We’ve been following an old disused shepherd’s path over private sheep farms. BUT. After it rains the green grass glows like emeralds and the air just sparkles. The sun makes rainbows in every drop of water hanging on anything. It’s kind of psychedelic. Time for a rest before we make the big climb. Camera in hand…come on Parole, you can do it! Here we come, Parole and I on the right. The path leads to heights of 1,000 feet and has excellent views of mountains, lakes and forested land. We stop often to let the horses rest and catch their breath. Our group was held together rather loosely in terms of friendship, but every one of us put the horses first. Cresting Hangman’s Hill. If selfies had been invented then we could have had the whole group in one picture instead of taking turns doing the honors and then mailing physical photos between U.S. and Germany. Parole, you’re a boss. (But it took him a 1,000 foot climb to make him stand still.) Isn’t he awesome, and handsome? And this is the photo I was taking, when our photo just above was taken. 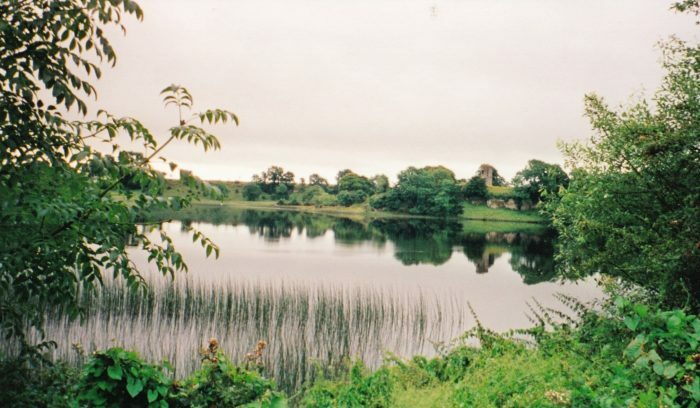 We ended our trek that day in the tiny village of Fivemilebourne where we overnighted in a farmhouse overlooking Doon Lake. The use of the term farmhouse is loose. Among ourselves we called it the “Magic House” because our hosts were an “Artist” and his wife, more about that later. They made us welcome and we turned our horses out in their lovely pasture. 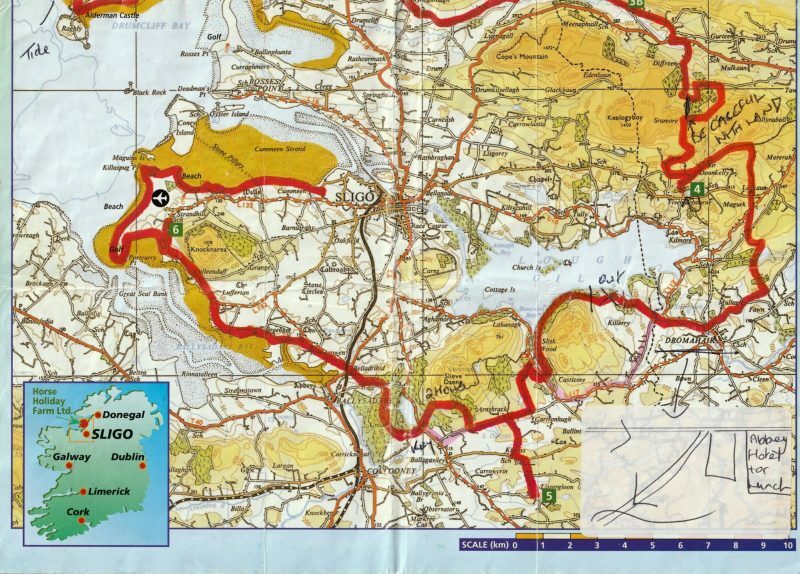 I hobbled down a few streets to Lough Gill. There was an old fort, Parke’s Castle that I was curious about, but it was getting dark, I had overestimated my remaining strength, it was very cold and windy, and I had to haul myself back up the hill to the “farmhouse.” Here we see one of the turrets in silhouette. I am a terrible tourist. So, we were invited to sit for dinner. We looked at each other. Guess what we were served? Fried fish, potatoes and, this time, carrots. We burst out laughing. Three nights in a row, the same meal, each day without lunch except what packets of cookies we could scrounge at a tiny grocery. We all lost weight, for sure. At least they had some wine. And then the “Artist” started inviting the women one by one to his attic “studio”. His art was something that, well, defies description, but one woman after another, including me, bustled back down his attic stairs with their eyeballs hanging out on their stems, and thankful to have their virtue intact. Only the rider husband was not invited to view the art. Just a bit creepily obvious. Yours truly in front, saddling our valiant Parole for the day’s journey. From this point, all I remember is this view and country like this. It felt dry, and it went on and on. We all plodded along very tired, horses and riders alike. Our destination is near the end of a long road that goes through low, dry looking hills with no trees and with scrub brush, then you came through that and all the houses start. 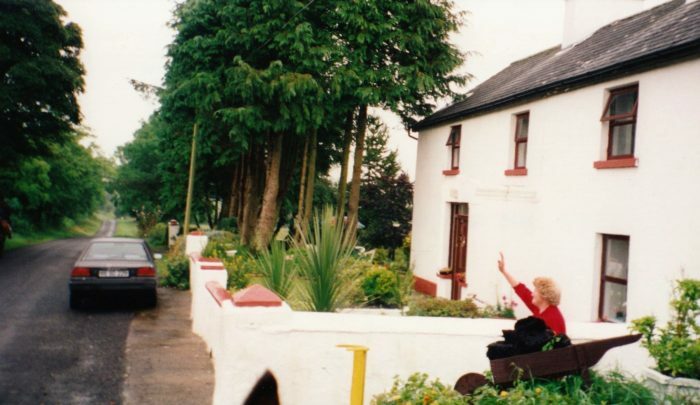 And then Mrs. Agnes McDonagh (“Aggie”) welcomed us with her special brand of hospitality. Aggie’s is a white house like all the other houses, but larger and grander than most with far more property, with an upstairs level where the guests stay. If you are facing the front, where there are big wonderful trees, there is a wall around the front courtyard and around the left of her house. Then she has a lovely garden in back with big tall flowers of all sorts, and then the wall comes back up to the house from the right. Instead of having a garden/yard on the right side of her house, there is a stable yard with a nice long stable of maybe 6 or so box stalls. On the right side of that is a big pasture which then goes around back and to the left of the whole property. A lovely small holding. Everything seems normal to look at it. But nothing is normal in Aggie’s world. Aggie’s husband used to breed racehorses and had died 20 years before, leaving her with this beautiful place to support, so she has taken in Horse Holiday Farm riders and who knows else. 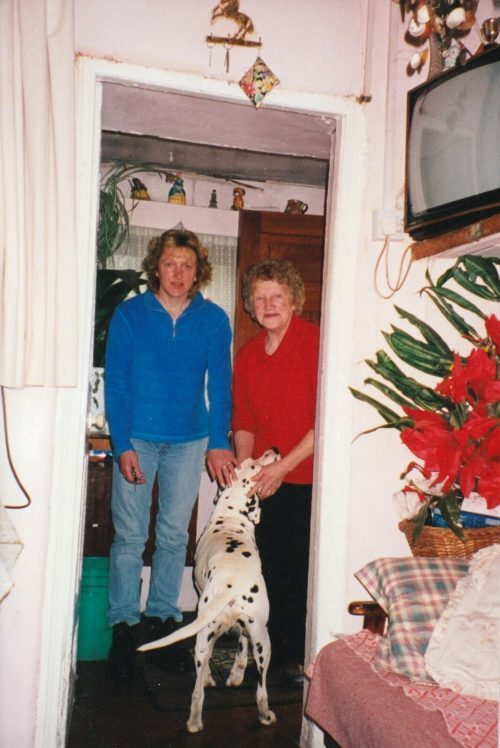 She is 82, strong as an ox, has big, perfectly round gorgeous blue eyes and curly blonde hair. HEART OF GOLD, just a loving sweet woman, but talking? She didn’t stop the whole time we were there, of course then there was the whiskey working too, but she was like a gatling gun firing, punctuated by JEEEZUSS CHRIST!! at the top of her lungs every few moments. We fed the horses and then turned the horses into her pasture, Aggie showed us to our rooms and got back to making the dinner. The attic has been made into, well, I would have to say rather flimsy bedrooms, the walls of which allowed one to hear EVERYTHING, as I had to warn our married couple next to me just in case they hadn’t noticed. For some reason in my room I had this bright turquoise freestanding plumbed-in sink. I sighed with relief at the prospect of having hot water and soap to wash my hands and face and get 8 hours of travel dirt off. I put the plug in, started running water and turned around to get a towel. 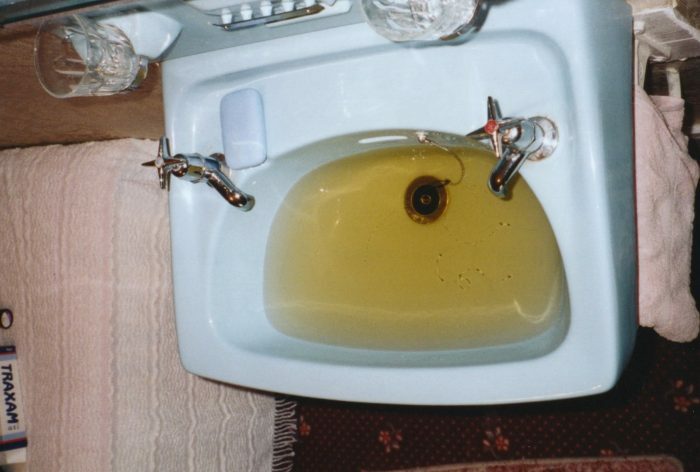 When I turned back, my bright turquoise sink was half filled up with tobacco-colored water. I got my camera, stood on a chair and took a picture, I was so amazed. Could sewage be leaking into the water supply, I wondered? I washed up anyway, praying I wouldn’t be infected by some terrible disease, and when I saw Aggie I asked as tactfully as I could about the unusual color of the water upstairs. Aggie has a rather nervous daughter of about 40, with the same beautiful, bright blue eyes, who rarely says a word but when she does, the same torrent as her mother styles starts to rush out, except that Aggie sails over her and just talks faster until she drowns Doris out. 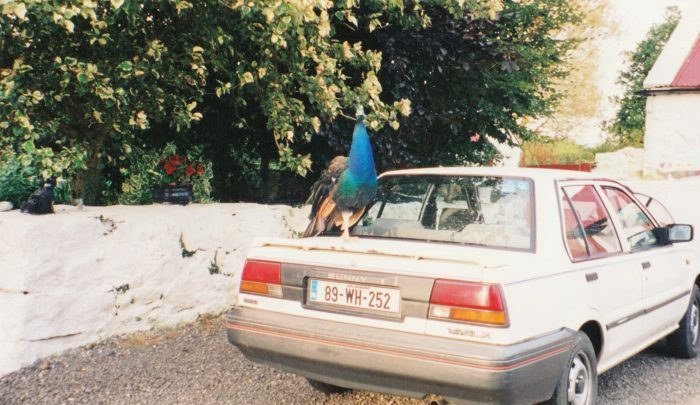 Aggie also has a peacock named Chuckie, “Chuckie the Peacock” is his whole name, and he usually stands on her white car so he may not only keep watch on the proceedings of the property, but to be admired for his own fine self. Aggie joined us at table, not eating but drinking more whiskey, talking, talking, talking, talking, talking. Doris sat with us too, but did most of the leaping up and down if anything for the table was needed. We were absolutely cracking up, we laughed so hard we could barely eat. Aggie was very much enjoying her table. Chuckie stood in a kingly, but somehow expectant way, on a very deep, comfortable ledge right outside the dining room window and longingly watched us, beak pressed against the window and he turned his head back and forth as we passed plates as if a spectator at a tennis game. On this night, we were thankfully spared fried fish, potatoes, and peas or carrots. I can’t remember what the dish was but it was not that. BUT. As a special treat for us, Aggie had gone into town and bought a store-made pie, a 6-inch high fluorescent pink creation made with that non-dairy white stuff people use (which scarily doesn’t dissolve in hot water) instead of whipped cream. And white crust about 1/2″ thick with the consistency of a brick. She was very pleased with this pie. She pressed us all to have a piece and all of us said we were full. Not to be daunted, Aggie cut me a HUGE piece and lovingly slapped it on my plate. Instead of shattering and falling apart like it would have had it been real food, it just made a deep thunking sound and bounced. I heroically restrained a shudder and was grateful that there were paper napkins on the table. Actually I needed many, because when she would leave to get a refill on her whiskey I would squirrel some pie into the napkin and wad it up. I had such a pile by my plate of napkins I had to pass a couple to the other riders–of course we laughed like fools. Also, (at that time at least) the Irish put tomato halves on the plate at each meal and we Americans are not used to that, nor do most of us particularly consider them a treat it seems, so we had fun passing tomatoes to the one person who did eat tomatoes all day, when Aggie wasn’t looking. Between Aggie’s antics, passing tomatoes, and me trying to spread the revolting fake pink pie around without getting caught, we giggled until we almost wet ourselves. Then there was Prince the dog, a little black and white terrier, who sat faithfully by Aggie’s side all night and followed her everywhere. When Aggie decided one of us needed something she would sprint like a cutting horse around the table to push more food on her subject, and Prince would sprint right behind her. It was like bedlam, with the machine gun talking and the peacock screeching outside and Doris coming in and out, and Aggie and Prince jetting around the table. We went to bed with our stomach muscles hurting and our faces hurting from laughing, and from our different rooms, because the walls were apparently literally made of cardboard, you could hear giggles start and then we’d all get going. I think we were near hysteria from riding in the rain for 5 days. BUT. Aggie was as dumb as a fox, even 3 sheets to the wind. The joke was on us the next day, which was our last day of riding. 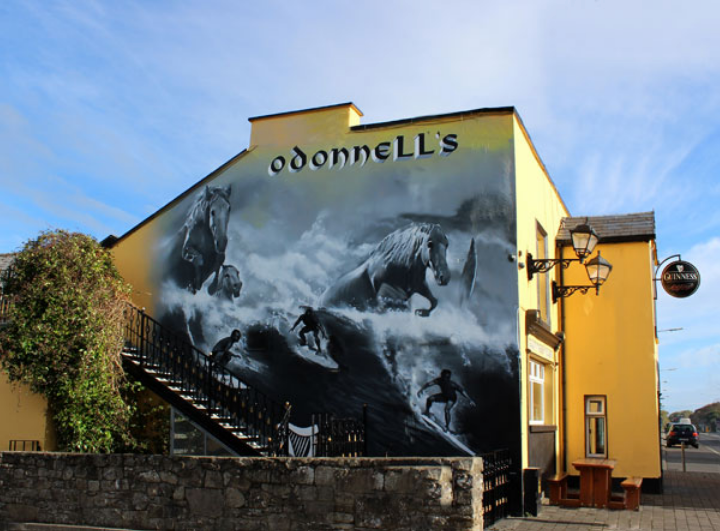 At dinner, we had asked her what time we would have to leave to beat the tides at whatever point we had to go around to reach Strandhill, our final destination. It seemed very far to us on the map (remember we had no guide) and since the Horse Holiday Farm marks on the road were so faint, there were a few times when old dried horse manure ground into the asphalt looked like a faint yellow arrow which was the standard of our ride, and we got lost at least once a day. So we were a little doubting and wanted to allow plenty of time. When we told her what time we’d have to leave (and thus what time she’d have to have breakfast ready) she stared us with those quarter-size round blue eyes (with an expression that we thought was pure vacancy after all the whiskey but which we later realized was genuine amazement) and shrieked, “JEEEZUS CHRIST!!!!!! THAT’S TOO EARLY!!!!!!!!!!! !” We jumped out of our skins and stared at her, thinking she was offended that we wanted breakfast that early. It took quite a while for us to gather what she meant was, it was a 3 hour ride and not a 6 hour ride like we thought. Of course we thought she didn’t know what she was talking about at this late hour…you know. We talked her into it, Aggie shaking her head the whole time. Aggie was noticeably quiet at breakfast the next morning. She talked very softly. We actually felt bad we had gotten her up so early after all the whiskey. BUT… when we finished our “6-hour” ride in 3 hours as Aggie had sworn we would and arrived at the point where we needed to cross but the tide wouldn’t be out until 3 hours later, and the tide was so very way in, all the way up to the road in fact, all 5 of us stopped in silence and turned to look at each other, started laughing hysterically and shouted “JEEEZUS CHRIST!!!!! IT WAS TOO EARLY!!!! 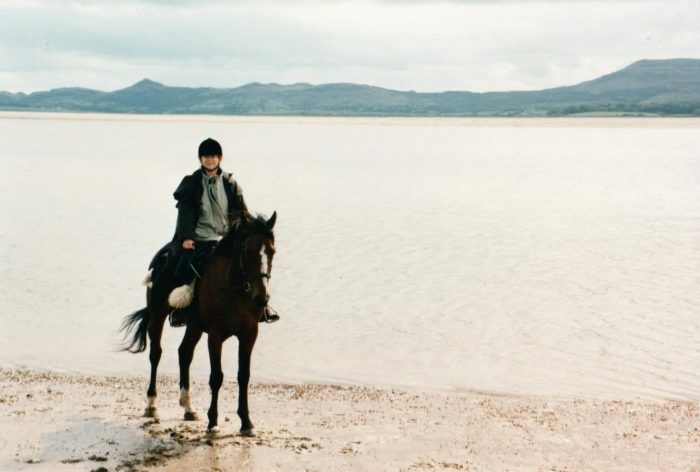 Parole and I at the end of the ride at Strandhill beach. The horses’ reward when we turned them out in back of our last overnight stop, at The Dunes Tavern. 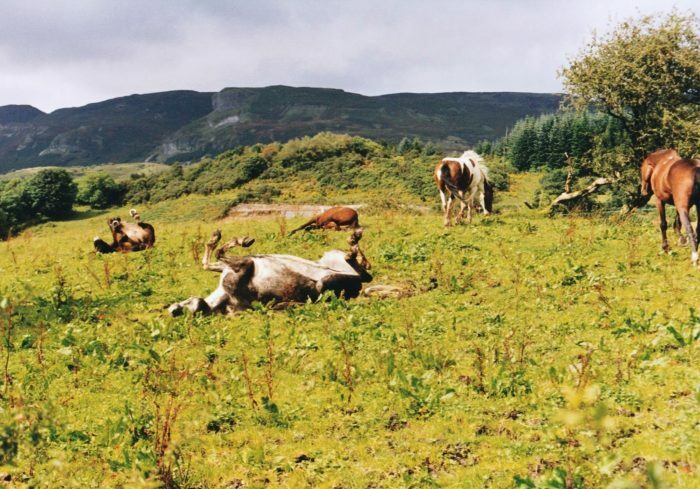 Having always wanted to visit Ireland, i was immediately drawn to this article. I love horses, ride as much as I can but do not fancy trail riding. Your travelog has done nothing to change my mind. 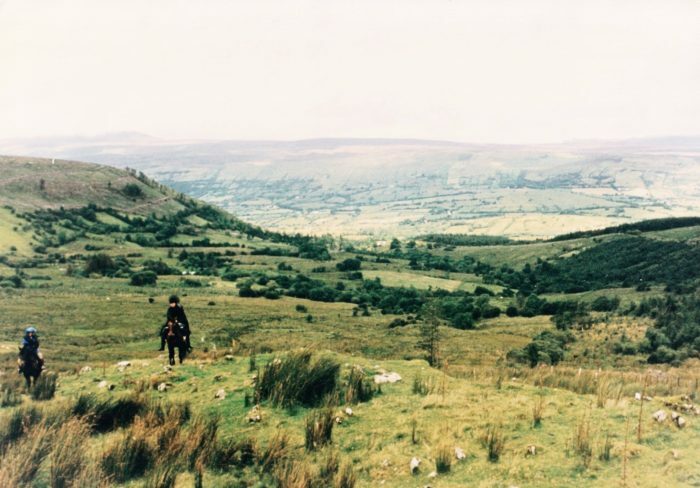 I still am drawn to Ireland but will not visit it on the back of a horse! I may visit a pub or tw but will more than likely choose a ***** lodging! All precautions considered, I am certain to break a bone or two on any trip I take. 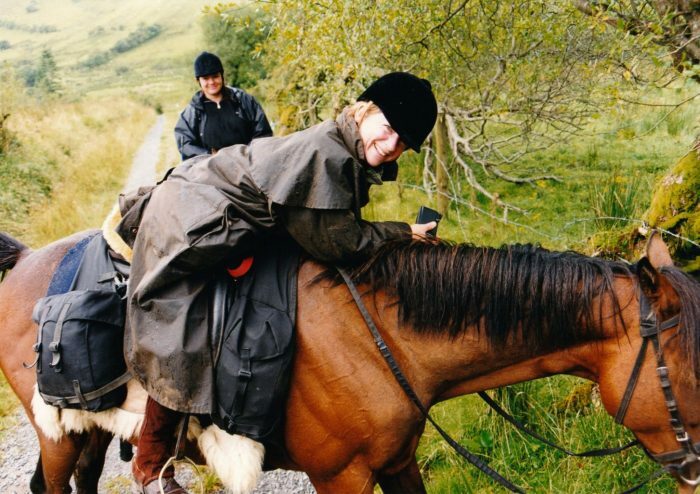 This took me right back to pony trekking in the English Lake District as a child! Although with substantially more supervision, the rides were always “interesting” and involved a cast of characters I thought I must have dreamed up…until discovering you had met similar folk. I can’t imagine that ride with a broken pelvis, I am truly in awe of your toughness to stick it out!